Last year, I made my friends buy me an iPod nano for my birthday so I could use Nike+ for my running. Nike+ is a technology that measures distance, pace and calories burnt (and a lot more) while you’re running. I’ll talk more about it later. Back to my iPod nano. 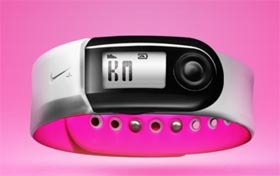 After I got it, I ended up not buying the required Nike+ iPod Sport Kit. It’s one of those procrastination things. So I’ve just been using my nano for music while I run. But I still want my Nike+ and I think I’ve found the right motivation to get it right now! 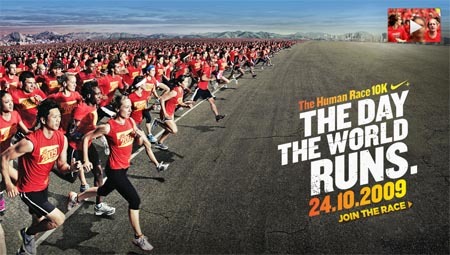 The Nike+ Human Race 10K is coming on Oct 24 and I’m eager to take part in it because it is the Day the World Runs. Literally! Last year, almost 780,000 people all over the world took part in this race. On that one day, all these people plugged into Nike+ and ran. And all these people were located in different countries all over the world. Very cool, is it not? This year, there’s an attractive spin to the race: The Guys vs. Girls Challenge, involving an attractive pair of celebrities to entice us to do our part for charity! 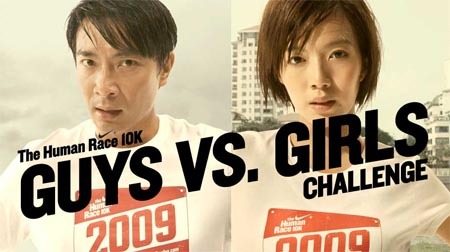 Tay Ping Hui and Rui En are leading a gender face-off, which is an ongoing charity event that will culminate in the Human Race 10K. From now till Oct 24, when you clock miles using Nike+, your miles will contributed to your gender. The gender that clocks the most miles wins! Each gender champions a different cause. Guys are running for WWF-World Wide Fund for Nature while girls are running for ST School Pocket Money Fund. Nike will donate $50,000 in stages to the winning gender’s charity in each stage. Um, the guys, led by Tay Ping Hui, are winning. They’ve already won the first three stages. Only two more stages to go! I reckon they should have made Tay Ping Hui lead the girls and Rui En lead the guys. There might have been a fiercer competition! In any case, we need more girls to take part. Give poor children in Singapore a chance. We need to win for the ST School Pocket Money Fund, too, so sign up here! 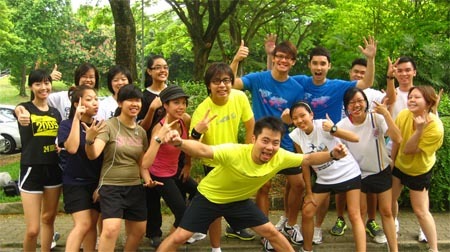 A while back, 98.7FM DJs got together to contribute miles for this good cause. Let’s talk about Nike+ now. First, the gear. You’ll need some Nike+ gear in order to take part in the Human Race 10K, as well as the Guys Vs. Girls Challenge. There are a few options to choose from. The Sport Kit comes with a sensor (to attach to your shoes) and a receiver (to plug into your nano). These two things allow your nano to register your runs and record your progress. You can either view the info on the screen or have it read to you via earphones. The iPod Touch already comes with built-in support for Nike+, so a receiver isn’t needed. Otherwise, it funtions just like the nano package. This cute little wristband (available in several colours) records your runs without requiring an iPod. When you get home, you can detach the black gizmo and plug it into a USB port to upload your run data. The Sportband comes with a sensor, which you’lll need to attach to your shoes. So, just get any of these and you’re ready to roll. But Nike+ is more than just gear. It’s a whole support system that connects you with runners from all over the world via the Internet. Once you get the gear and get plugged in, a whole new world is opened up to you. 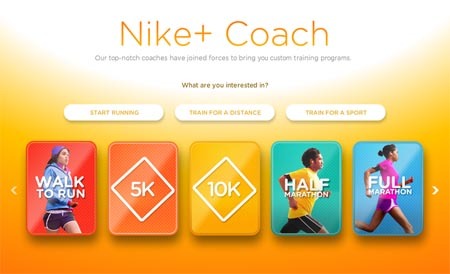 You will be able to find, on the Nike+ website, a whole lot of activities and training options. For instance, you can upload your run data online to tell the world how much you’ve been working out. You can compete with your friends or motivate each other online without needing to physically run together. There are also cool programs like Nike+ Goals and Nike+ Coach, which help you set specific goals and customise training sessions. But the coolest thing about Nike+ right now is that it allows us to be part of the Human Race 10K. I’m so hyped about it! I wonder how many participants there will be this year. A million? Taking part in the race is simple. All you need to do is sign up for it, then get some Nike+ gear and sync it up on Oct 24. You can run anywhere, at any hour, on that day. It’s literally the biggest race in the world, ever! I have some friends who love running but shun races because they’re afraid of crowds. So I think this is just the race for them. They can pick a quiet spot to run on Oct 24 and still be part of the biggest race in the world. Nike+ would be great for them. What about you, then? Are you going to be a part of the Human Race 10K? Hi, May i know where you get the pink arm band from?? Thanks!! hhmm…. i can run in m’sia? Hey Bryan, you can get the sensor at any Nike store.